For once, an Apple product isn’t the hottest piece of hardware on the scene. This week, at least, that highly enviable status goes to Google’s new Nexus 7 tablet. According to reports, several retailers are sold out of the 7-inch tablet, and even Google’s own online store only has the cheaper, $199 8-GB version. The $249 16-GB version is no longer available anywhere except on eBay for a steep premium. * It looks and feels, to use the technical term, slick. The fact is, Apple’s products have a look and feel that few can match, and even the Nexus 7 doesn’t quite get there. But it’s pretty damn close. It feels substantial, while substantially lighter, of course, than the iPad. The swiping is very smooth as well. * The 7-inch size is appealing and convenient. It’s easy to hold it in one hand, while swiping with the other. It also fits in a pants or shorts pocket (or purse, I’m guessing) surprisingly well for temporary transport. So I end up taking it more places than my larger tablet. * The screen is no Retina like the latest iPad, but it still looks sharp and bright. * It may not have all the apps, or some of the latest and greatest, that Apple has, but it’s got plenty. And some very nice ones, too, such as Flipboard and my current favorite, The Night Sky. * Almost forgot–it’s cheap! For $199, it’s less than half the current $399 minimum for an iPad. 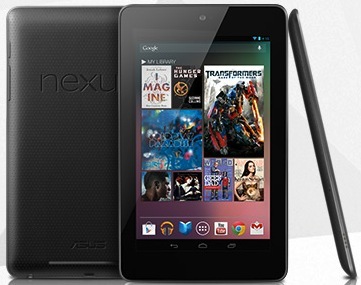 That makes the Nexus 7 close to an impulse item, or at least a gift that won’t break the bank. * Uber-reviewers Walt Mossberg of the Wall Street Journal, David Pogue of the New York Times, and even Apple fanboy/Google hater MG Siegler, himself, all like it. So does almost everyone else. For all that, I can’t help mentioning the downsides. The default screens are a mess of apps, My Library (which features an Esquire cover of Bruce Willis that I really don’t want to see anymore), and recommended apps and magazines I couldn’t care less about (Country Weekly magazine? Really?). You can change the app organization, but at the outset, it’s haphazard, making it hard to find some basic ones at first. In particular, the nondescript icon for Google Play, which seems really key to Google’s ultimate success at mobile devices and apps, doesn’t suggest an app store. And who besides us Google watchers know that “Google Play” is an app store anyway? As many have noted, there’s not much content in its Google Play store. But that means little to me because I’m a Netflix subscriber and can watch using the Android App. There’s also a Hulu Plus app. (But not Amazon Instant Videos via my Prime subscription, at least not without browser tweaks few will want to bother with; that may be a deal-killer for big Amazon video fans.) The device doesn’t have a rear-facing camera. Since I’m not using a tablet to take photos (partly because, in what is a weird omission, there is no built-in camera app), and since Skype is one of the killer apps as far as I’m concerned, the single front-facing one works fine for me. It’s WiFi only, though again, I wouldn’t pay for another monthly data plan anyway. And with only 8 or 16 GB of storage, you better be comfortable storing most of your stuff in the cloud (I am). Finally, there’s apparently a problem with the touchscreen, though I haven’t run across it yet, that’s especially a problem for playing games. My own minor complaint about the screen, which I haven’t seen mentioned in reviews I’ve read, is that it’s just a tad too small, or at least the border around the screen is. It’s hard to pick up along the side, because too often I end up touching an icon and launching an app or stopping a video when I don’t want to. The recessed side buttons are a little hard to reach sometimes, too. These are quibbles, though. Meanwhile, it looks like Apple is readying its own smaller iPad for under $300. That could well steal the Nexus 7’s thunder–especially since it almost certainly will do two or three things better than the Nexus 7 because it’s Apple and because it will be newer. But for the next few months, at least, Google has a bona fide hit on its hands. And for all the right reasons, not just manufactured scarcity. Read the original post at The New Persuaders.